Are you a business owner in Cape Verde? Promote your business 365 days a year with the #1 Guide to Cape Verde. 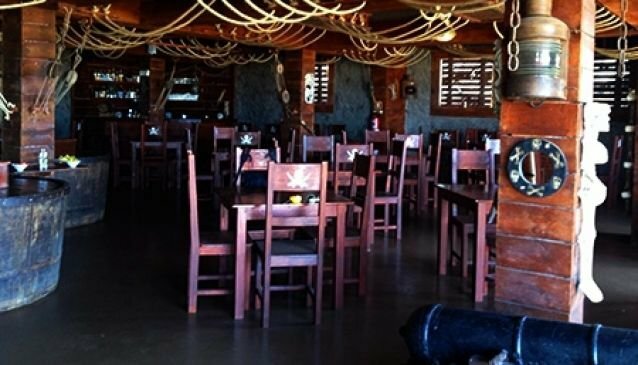 Churrascaria Pirata, situated just on the edge of Santa Maria is a Brazilian inspired all you can eat restaurant. It's a fantastic choice for those meat lovers looking to get a little something extra for their money. The restaurant interior follows a 'Pirate' theme resembling an old sailing ship, with memorabilia, including cannons scattered throughout. The attractive wooden chairs and tables with skull and crossbones add to the Pirate flavour. The buffet starter will set you up for the main event, a selection of meats, served on skewers and carved directly onto your plate in front of you. Accompany your Brazilian dinner with a Caipirinha for the perfect Brazilian combination. My Guide Cape Verde is part of the global My Guide Network of Online & Mobile travel guides.